On 24 August 2018, Assoc. 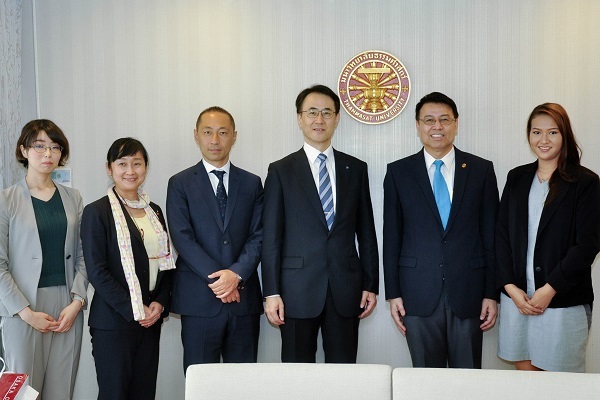 Prof. Dr. Kitti Prasirtsuk, Vice Rector for International Affairs, met with Prof. Dr. Hiroyuki SAKURAGI, Vice President (Research and PR) and executives from Osaka City University (OCU), to strengthen the relationship and discussed further collaboration, including student exchange, short–term internship program. OCU economics postgraduate program is increasing English courses to develop into an international program. Furthermore, both sides discussed about health science collaboration that OCU has eminent medical centers. On 27 August 2018, Assoc. Prof. Dr. Kitti Prasirtsuk, Vice Rector for International Affairs and Asst. Prof. Dr. Supranee Lisawadi, Assistant to the Rector for International Affairs met with Mr. Kohei Tagaki, Team Leader, Office of Global Education and Collaboration, and a delegate from Sophia University, to discuss 2-week internship for exchange students from Sophia University and Thammasat University students at Japanese companies in Bangkok. The internship shall take place after the exchange period ended at Thammasat.